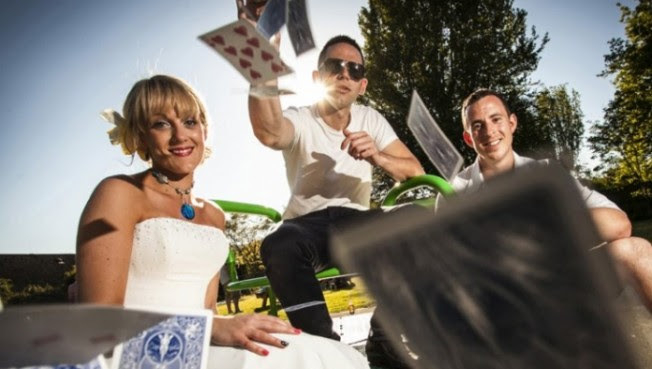 Magicians for weddings and events are available to hire in a couple of different formats. Firstly, they may be booked to perform walkabout close-up magic with objects such as cards, phones and coins. This is perfect for wedding entertainment as it helps to break the ice between guests and helps them to mingle. However, many are also available to provide a magic stage show (or cabaret show), which is ideal for corporate gatherings, or, as after dinner entertainment. Whatever your preference you will find the perfect magic act to suit your wedding or party below… Abracadabra! Close-up Magic (or, table magic) is performed to small groups by a magician who works with everyday objects such as phones, watches and coins, and, is able to move easily and smoothly from one group or area to another. The magic is performed in plain sight without the aid of any lighting, mirrors or large props. The good thing about close-up magic is that it is self-contained and can be performed at a moment’s notice and similarly stopped just as quickly. A close-up performer can typically entertain approximately 30 – 50 people per hour, depending on the crowd and based on big tables that seat 10 people. So, make sure you book your act for the appropriate amount of time so that they can get around all the tables or guests. Close up magic is perfect for weddings and drink receptions. Cabaret Magic is great as after-dinner entertainment at corporate functions or any large gathering and is more interactive than stage magic. A show can last from 20 to 40 minutes and is suitable for audiences of up to 150 people. Stage Magic often features large-scale illusions and involves less audience participation than cabaret does; the spectators simply watch in amazement as objects appear from nowhere, disappear and / or behave in mysterious ways. Stage magicians are suitable for audiences of 150+ and is typically performed within an auditorium.